Cobble stones are unique in their versatility, they are likely one of the most used stones in Nigeria for varied ideas, while some builders prefer to use them for fence wall decorations, others implement it on their columns and gate pillars. But an appreciable percentage of people make use of cobble stones for interior wall decors. 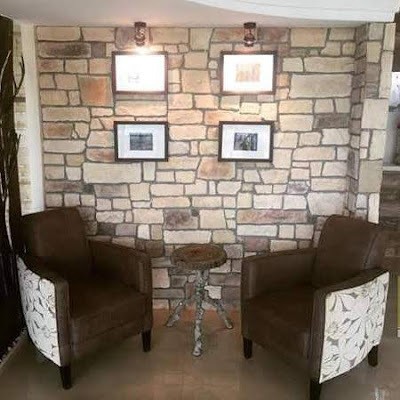 Here in Nigeria, many home builders make use of veneer stones and bricks for their exterior walls, but with dedicated awareness from Farad contractors Nigeria limited and our parent partners, we are gradually getting a good number of home owners and builders in NIGERIA to continue adopting the interior decor ideas with stones and bricks. Here is a well thought rendition of cobble stone in predominant beige color on corner of the sitting room, apt and romantic are some words that may come very close to its definition. Interior use of cobble stones gives your interior space this new spice of nature on the wall, making you live close to the friendliness of the natural environment. The colors you choose for your interior cobble stones also matter, as a rule, we make use of calm color ratios against loud color ratios for interior cobble stone use. This in turn offers that cool ambiance needed for your interior space. We as a company offers all the colors of cobble stones for both interior and exterior use on building walls and we are always here to help you make the best decisions about the appropriate colors for your interior use of cobble stones.